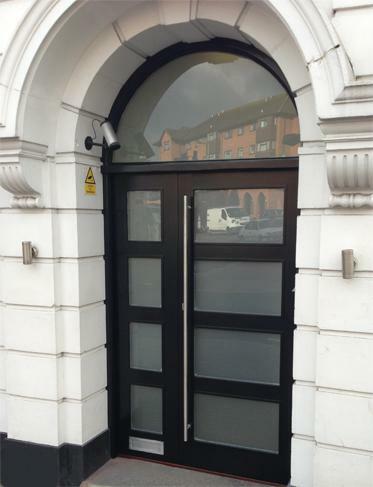 Bespoke External Hardwood Door set (Door and a half) in an arched frame with obscured double glazed glass panels. Contemporary entrance to a high end commercial development. 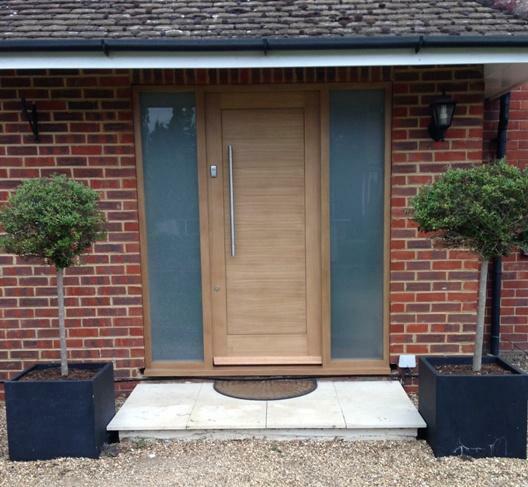 Installed by Modern Doors Ltd.
Semi bespoke door set including readymade Modica Oak front door in a bespoke solid european oak frame with two fully glazed side panels (obscured toughened double glazing). Featuring oak weather bar, Steelworx T pull handle and set of Era locks. Prefinished and installed by Modern Doors Ltd.
Bespoke External door set with 2 fully glazed side panels (obscured glass), made of solid European Oak, prefinished and installed by Modern Doors Ltd.
Bespoke internal flush white painted door with two vertical aluminium strips in satin finish and matching fully finished white frame set with architraves. Installed by Modern Doors Ltd.
Bespoke external hardwood porch with a traditional style double door and glazed sidelights and toplights. Obscured glass with georgian wire imitation etched in the doors and house number in the top light. Spray painted in grey. Bespoke internal Oak veneered door and frame set with architraves - Valetta design with custom stain to match client's sample. 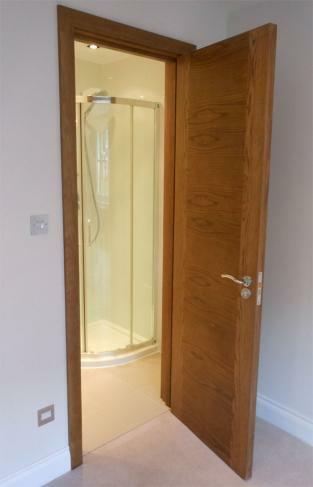 Installed by Modern Doors Ltd.
Bespoke Internal Oak veneered double door in clear satin finish, with 4 panels of clear glass. Installed into existing frames by Modern Doors Ltd.
Bespoke internal fully painted doors with horizontal V grooves - Monaco style and a matching glazed door with obscured glass. Installed into existing frames by client. 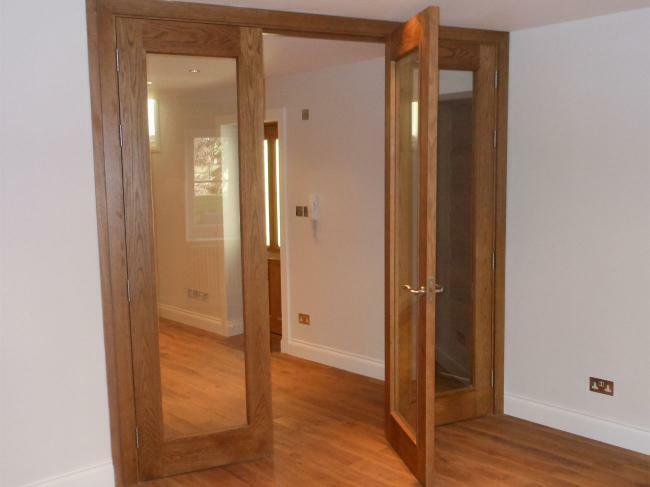 Bespoke internal triple door set - Oak veneered doors and frame with custom stain finish. Clear glazing in doors. 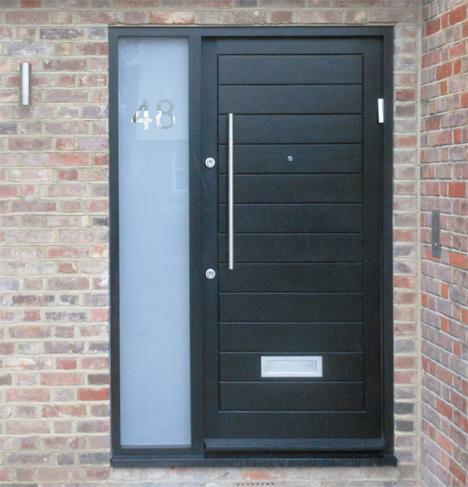 Installed by Modern Doors Ltd.
Bespoke External door set with side panel - made of solid hardwood, painted to match Crown Herringbone colour sample with obscured glazing in the side panel. 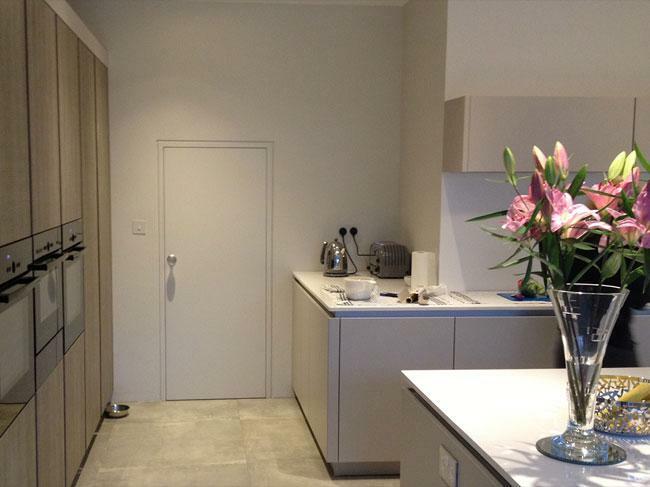 Installed by Modern Doors Ltd. Combination door set - standard external double door (La Porte French doors) and bespoke solid European Oak frame with clear glazing into side and top lights. 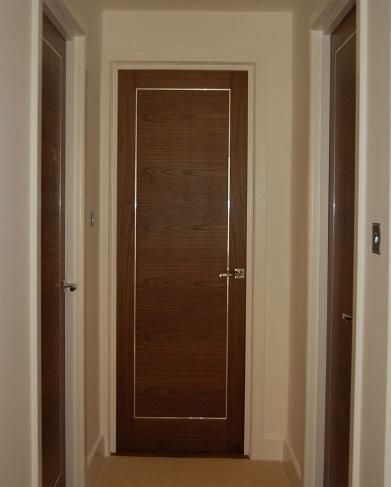 Prefinished and installed by Modern Doors Ltd.
Bespoke Internal Walnut veneered door - Valetta design with solid aluminium trim in polished finish. 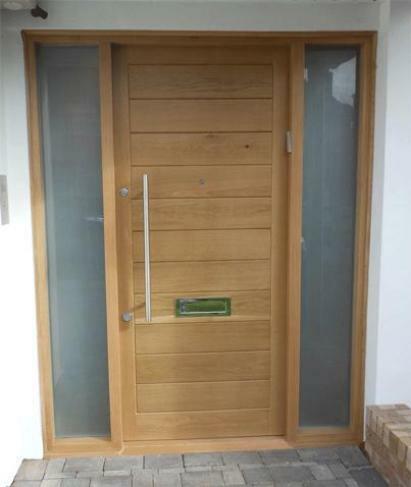 Installed into existing frames by Modern Doors Ltd.
Bespoke External door set with 4 vision panels in the door, glazed side and top light (clear glass), made of solid European Oak, prefinished and installed by Modern Doors Ltd. 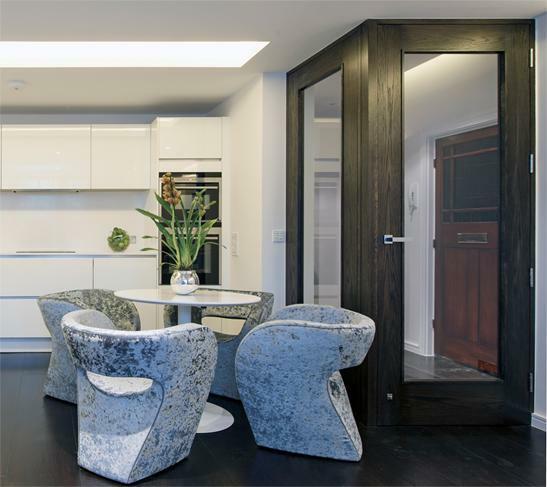 Contemporary standard Internal Oak Doors - Ravenna with clear satin lacquer. Prefinished and installed by Modern Doors Ltd. 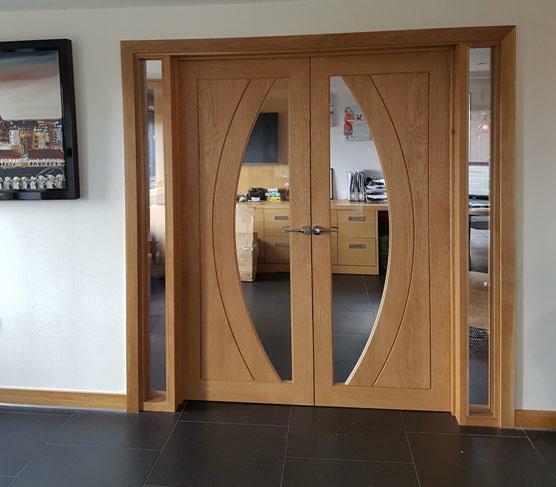 Contemporary standard Internal Oak Ravenna Glazed Doors with custom stained finish. Prefinished and installed by Modern Doors Ltd. 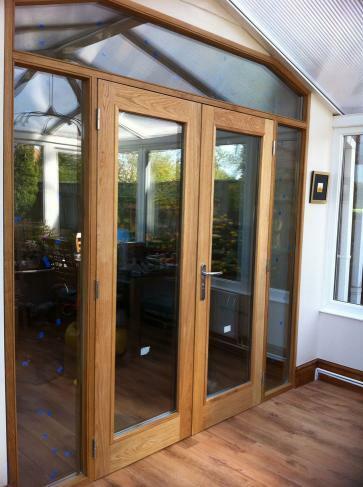 Custom made Salerno Oak Glazed rebated pair with glass sidelights in a custom solid oak frame. All prefinished in clear lacquer. 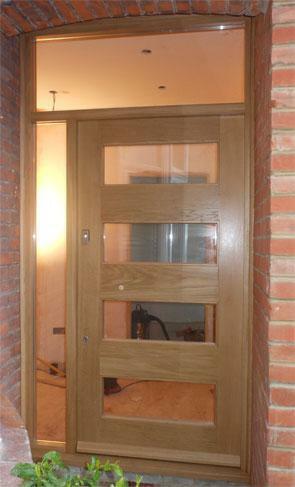 Bespoke oak rebated french door (double door), dark stained in a matching solid oak frame. An example of classical 2 panel design with unique mouldings in this elegant fire rated internal french door. 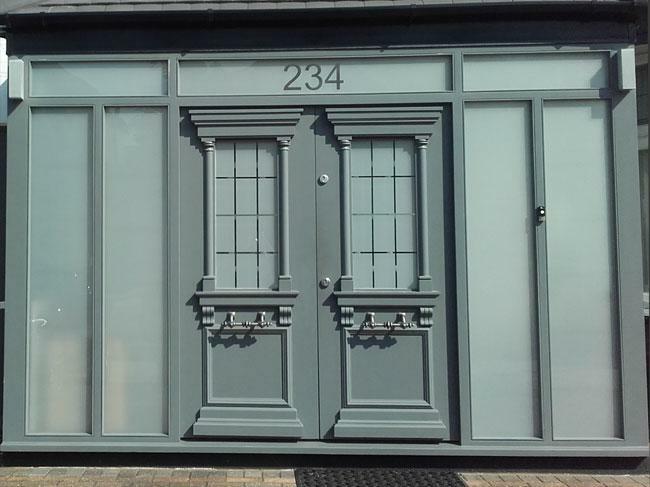 Made bespoke in a matching door frame, including fire and smoke seals for this stylish period property. 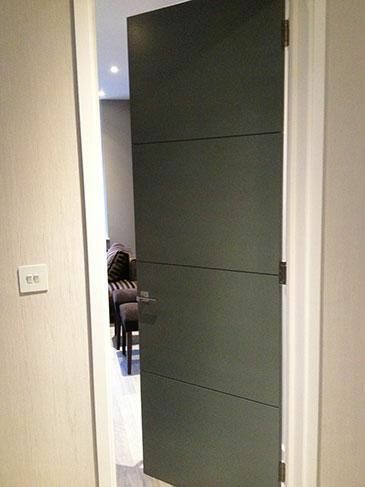 Bespoke internal door with 3 horizontal grooves, spray painted in grey glossy finish. Flush white spray painted door set. 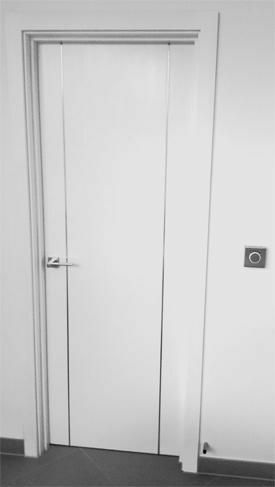 Modern door frame with shadow gap and no architraves. 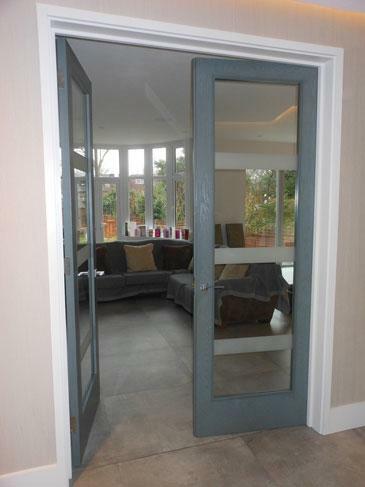 Custom made internal rebated french door (double door), grey stained oak. Glass with etched/sandblasted horizontal bars. 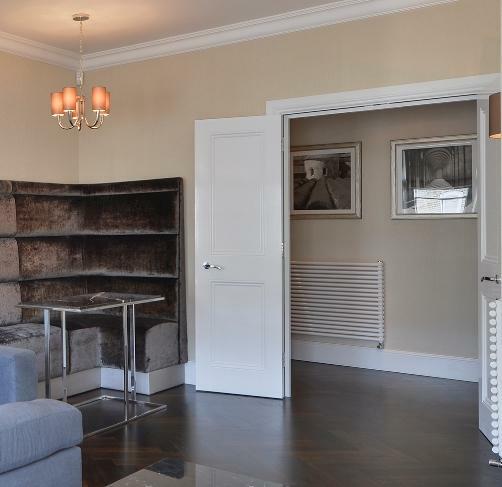 White painted hardwood frame set with architraves. 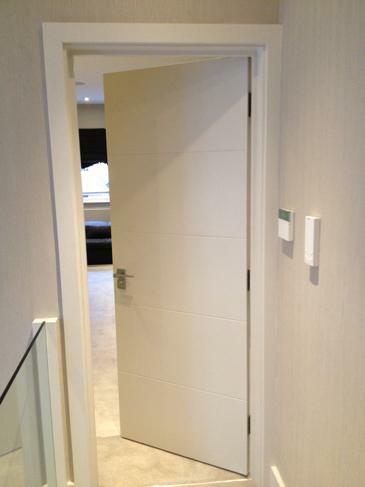 Custom made internal white door with 4 horizontal grooves, spray painted in white with a matching frame set. 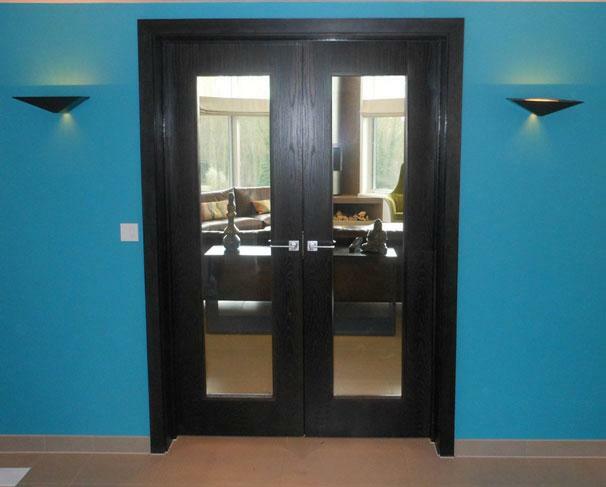 Custom made contemporary front door set in solid hardwood, spray painted in black. Obscured glazed sidelight with a a house number etched. 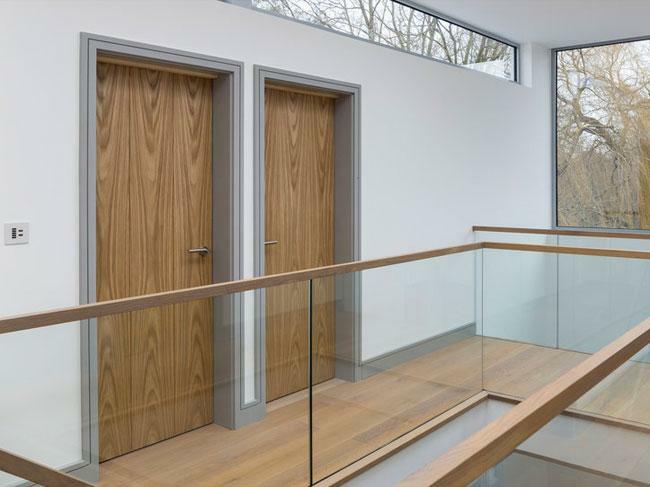 Custom made flush oak internal doors with vertical grain. 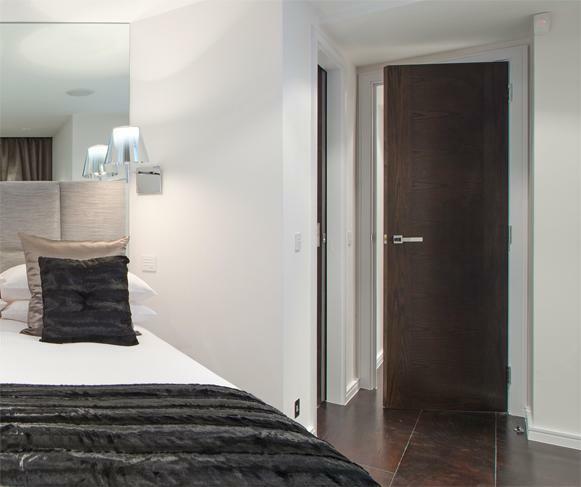 Installed into grey painted frames in this modern development. 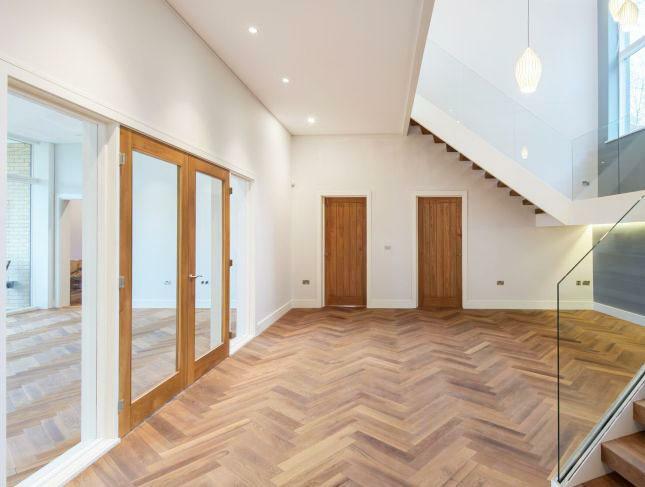 Vertically boarded solid doors and glazed rebated double door with sidelights, all oversized to suit the spacious modern home with high ceilings. 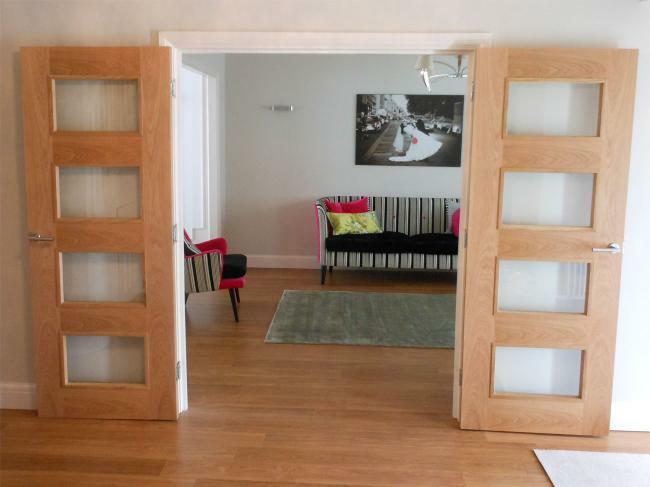 Doors supplied in solid Ash stained to match a sample with white painted frames.